We must understand the importance of forms before we move on to light and shade or colors. An artist is always inferior without the right drawing or delineation of forms. That is to say, you can never attain the foundation of art without knowing the outline or form of an object. For instance, consider few wooden models as examples for demonstration. You would realize that there are no absolute outlines of nature. Let us demonstrate forms by means of various planes of light and shadow coming together. We see that the edge of the forms is visible due to different tones of planes. Not to mention, one of which is lighter or darker than the neighbour. Besides, the values of these planes depend on many factors. Some of which are the direction, kind and source of illumination that the objects receive. Sunlight can be either direct or indirect. Also, sun rays are parallel. An object in the direct path of sun’s rays is brilliantly illuminated and cast distinct shadows. Besides, we can also consider an object receiving indirect sunlight from the lighted air. Artificial light may be of various kinds. The sources could root from an arc, incandescent lamp, gas burners or candles. Besides, the light comes from one point and diverge. DO YOU KNOW WHAT CHIAROSCURO IS? ‘Chia’ means light and ‘scuro’ comes from the word obscure/dark. Thus it is a combination of two words- light and dark. The Renaissance artists came up with the term Chiaroscuro. It describes the depth and volume of light. We know that values create the illusion of mass and volume on a two-dimensional surface. Also, it creates an illusion of depth called ‘intuitive space’. It is an artistic method to trick the viewer into seeing depth. Imagine illuminating an object from several directions all at once. The sources could be from windows or largely separated lamps. We call this diffused illumination. As easy as it sounds, front lighting is easily explained. For instance, imagine a source of light in front of an object. That is to say, the nearer surface receives more light than the rearer which is in shade. This illumination is front lighting. The light rays illuminate the rear side of an object as they move towards an observer. Thus, the frontal surface falls in shade and casts distinct shadows towards the observer. Imagine an object resting on a white table. The light from the table reflects back to the object, making the shadow side lighter. Similarly, if an object rests on a black or dark table, the middle tones become a dark reflection. This is widely used to formulate theories of light, shade and shadow casting. Here, we light the object in such a way that the casted shadow is about the same length as the height of the object casting it. Besides, the contrast of light and shades are clearer over any condition of lighting. 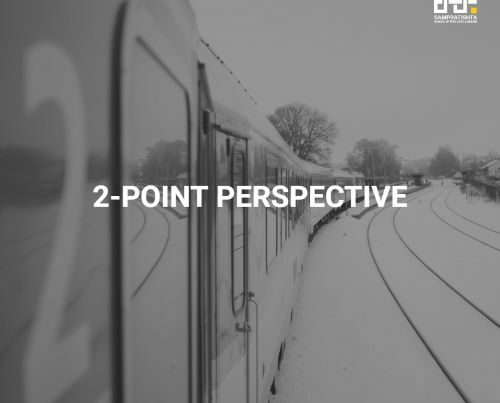 I bring this blog to an end. Above all, I hope this post has been of little help in understanding the skeleton of light. However, we know practical demonstrations are always beneficial in comprehending the concepts for a lifetime. Follow my next blog for shade and shadows. 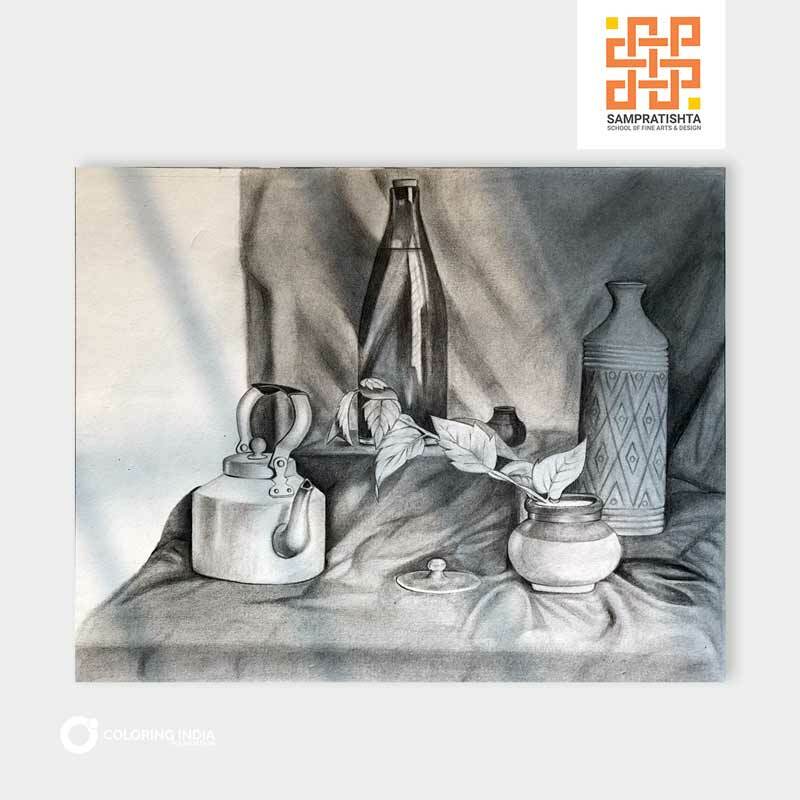 Want to learn the concepts of light and shade from the first fine arts organization in Bangalore? Or, it’s always a good idea to learn outdoors. Soak amidst nature with Pencil and Chai’s outdoor realistic classes.